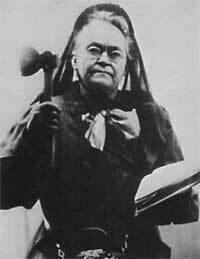 Carrie Amelia Moore Nation (November 25, 1846 – June 9, 1911) was a radical member of the temperance movement, which opposed alcohol in pre-Prohibition America. She is particularly noteworthy for promoting her viewpoint through vandalism. Nation frequently attacked the property of alcohol-serving establishments (most often taverns) with a hatchet. Recently, Nation's behavior has inspired fiction writers as well as an opera composer. Nation was a relatively large woman, almost 6 feet (180 cm) tall and weighing 175 pounds (79 kg), with a stern countenance]. She described herself as "a bulldog running along at the feet of Jesus, barking at what He doesn't like," and claimed a divine ordination to promote temperance by destroying bars. The spelling of her first name is ambiguous and both Carrie and Carry are considered correct. Official records say Carrie, which Nation used most of her life; the name Carry was used by her father in the family Bible. Upon beginning her campaign against liquor in the early 20th century, she adopted the name Carry A. Nation mainly for its value as a slogan, and had it registered as a trademark in the state of Kansas.